Kozmo suggests, "Mom, let's go somewhere." 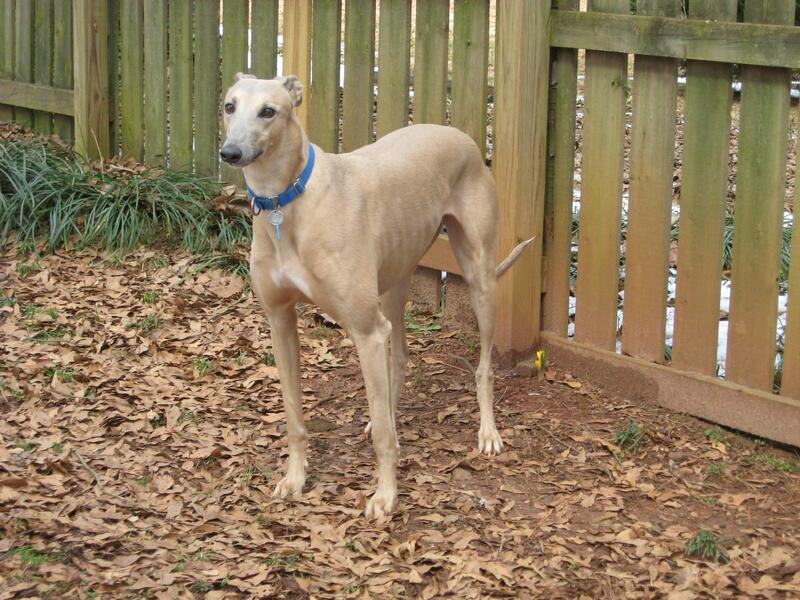 It all began with an invitation to go to a Greyhound picnic on Sunday at Harbison Park just outside Columbia; I was excited at first, and ready for an outing with King Kozmo. But then, my “second thoughts” alter ego kicked in…on Thursday, I had gone to visit Cliff’s niche at Forest Lawn and thought it would be a good quiet place to leave Kozmo in the car and see how he reacted. Can we say OVER-REACTED??? He frantically wanted to get in the front seat (I could see this as I peeked thru the bushes…out of HIS sight range) and, in doing so…clicked the switch on the dome light so that it stayed on until being manually turned off…something I didn’t discover until the next morning as I left for work. As I continued musing, I thought… this does not bode well for a person with IBS on a two-hour car trip who just MIGHT have to use the Rest Area facilities. Big strike against going to picnic! I packed up the water bowl, thermos of ice water, treats, plastic grocery bags, kitty litter-sized pooper scooper, dog bed, and we were off. I found a parking space right across from the activities, and as I put the car in park, he started getting agitated and whimpering. He heard young children and crying babies and saw people who didn’t look familiar and HE didn’t like it, even to the point of not drinking any water when he got out of the car, despite the fact that he was panting heavily. But, we continued…and walked along the crowded sidewalk where a young boy shouted…look, Mom, a Great Dane!! Close enough, I thought. Surprisingly, Kozmo wasn’t all that affected by the people walking by, but he had to sniff EVERY last piece of grass…so much for “strolling.” We then moseyed along a path with vendors on either side selling everything from wood carvings to funnel cakes…Kozmo got one of his inferiority complexes and decided to do the LEAN AGAINST MOM THING…but, what the heck, it’s only 80 lbs. Lady from Humane Society gave him a chewy treat…he promptly laid it on the ground and started moving on…I apologized. Next, a sweet young girl…approximately 12 years old came over and started petting him…no reaction…tail tucked and ears back. I apologized for his lack of attention to her affection and said that Kozmo was just new at public outings. She screamed out…THAT’S KOZMO???? I SAW HIS PICTURE ON THE INTERNET AND THE HOMETOWNER AND I BEGGED MY DADDY TO LET ME GET HIM. Can we say attention-getter??? Finally…it was really, really time to go home…when my dear sweet sight hound sighted a pond…and what was IN that pond?? Geese/ducks … things that are small and wiggly…HIS (or shall I say MY) worst enemy. Note to self: take Tylenol when you get home muscles in arms and legs will be very sore after trying to restrain mini-horse! Note to self: Have big glass of scotch on rocks after taking Tylenol…then take a nap…maybe I’ll awaken and find it was all one ugly nightmare. Moral of story: Pretend you don’t know the king sized dog at the end of the leash you’re holding. Probably in the swimming pool with Mary Ann and Kozmo. LOL! I’m still laughing with tears streaming down my face….thanks so much for the laugh. I’m on my second big boy greyhound, and they are the BEST!! Heh, before Mary Ann adopted Kozmo, he too was standing near the same exact tiny grassy area near the front of the store. He did the exact same thing there. The provided poop bags were too small for his output. Time to get the white plastic sales bags! He was nervous and it looked like a small horse had been there. He’s a good boy, really! LOL!!!!! I can so relate!!! My Tank did the same thing only it was in the busy parking lot potty space in front of Petsmart! I thought I was going to die!